fit our dials into the dash only, the fitting guide does not explain how to "remove or replace"
the dash in your vehicle. removed from the dashboard to gain access to the dial faces. The majority of dashes do not require the needles to be removed to fit our kits. ( Some dial kits may require some needles to be removed due unfortunate layout of the dash). but advise is available to refit and calibrate the needles. or replaced as these dial kits have there own built in ( el lighting). you to change the colour of these dials from Blue and Red, to Green and Red. You will require a couple of screwdrivers, a Stanley knife, and electric connectors. This is one of those jobs that once you have done it the job, it is easier than you think. that looks great when fitted in during the day and night. if you require any advice regarding fitting. bring the vehicle to UK standards. one of the requirements is the speedo (km/h) conversion. continue to operate in km/h. B/ The original speedo will have a speedo chip fitted, this will then convert all the speedo electrics/mechanics to operate in mph then the 0-180km/h dial face will have a bit of black tape put over the k so you will only see m/h = 180 m/h your complete speedo will then operate in mph and the trip mileage will from this point rotate in mph. Q : my speedo is still showing origional import 0- 180kmh what options do i have? will read rotate in mph. Q : my speedo shows 0-180 m/h? with black tape over the k (m/h ) on the dial face? 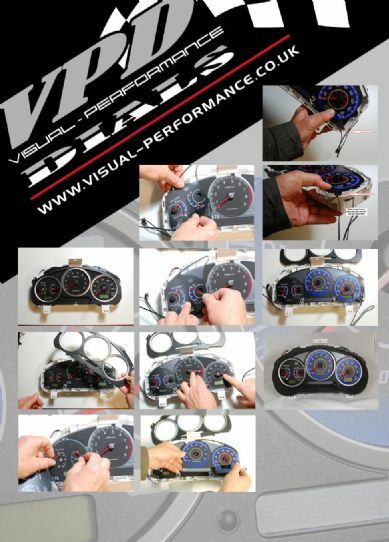 A : You have a speedo convertor already fitted, so can fit our 0-180mph dial kit. Q : Are these dials legal for an MOT. I hope we have been of help and answered your questions? please do not hesitate to ask if you have any further questions. Kindest regards Visual-performance auto styling. to yourself or anybody else whatsoever.